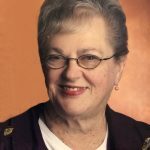 Patricia Scarbrough, 77, of Los Feliz, CA, formerly of Champaign, lost her battle with cancer on March 19, 2019. Pat was born August 9, 1941 to Charles and Elizabeth Endsley of Kankakee. She married Darrell Scarbrough of Bondville. Her parents and husband preceded her in death. Pat is survived by her daughter Debra (Dan) Poling of Redmond, WA, and son Brad Scarbrough of Los Feliz, CA, brother-in-law Gary Kuhns of Mahomet, two grandchildren, Luke and Camryn, two nieces, a nephew, and several cousins. Pat attended University of Illinois and Olivette Nazarene University. She worked as an administrative partner in the ER at Mills/Peninsula Hospital in San Mateo, CA for 30 years. After retirement, she spent many years in Redmond, WA near her daughter and grandchildren. For the last 2 ½ years, she has lived with her son in Los Feliz, CA. Pat was active at Washington Cathedral Church while living in Redmond, WA, then Christian Assembly, Eaglerock while in Southern CA. She enjoyed making cards, scrapbooking, bible studies, music, and had a very strong faith. Memorials may be made to Sandler Kenner Foundation (https://helpfightpancreaticcancer.org), associated with Mayo Clinic, to fund research for early detection of pancreatic cancer. Pat was cremated and her ashes will be buried at Grandview Memorial Gardens in Champaign, IL, next to Darrell. A graveside service is planned for 2:00 pm on Thursday, April 25th. Condolences may be shared at www.morganmemorialhome.com. Be the first to share a memory of Patricia.